The time has come to face the villain of the story. The party pulls themselves together in a last stand at the end of the world, fights to the top of Kefka’s tower, and listens through his evil monologue describing his reason for living–chaos, destruction, and nothingness. We know no reason as to why Kefka is the way his is, but his drive for chaos, the power he has amassed, and his edgy nature have made him into the archetypal terrifying villain. If nihilism can be personified, Kefka is it. Now is the group’s last chance for redeeming any little bit of good in the world that Kefka has not yet destroyed. The fight is separated into four parts, and so the music accompanying is divided into four movements. The first three movements are the three sections of Kefka’s monster tower, pictured in the intro post. 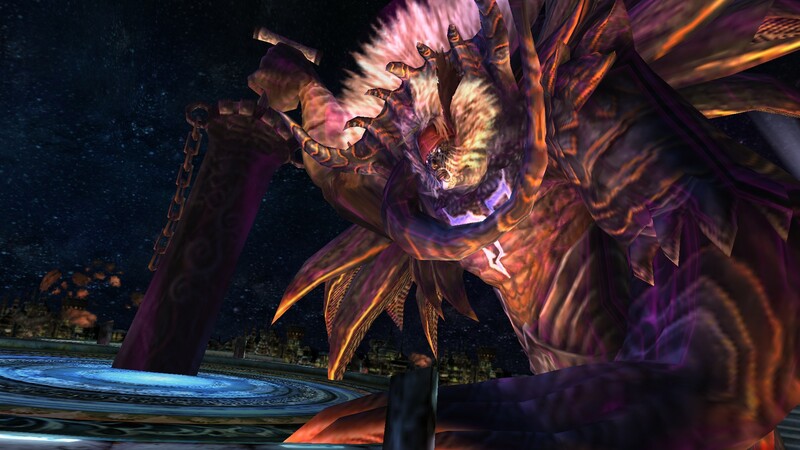 The bottom shows a beast bearing no small resemblance to Jecht, the Final Aeon in FFX, known here as Visage. While fighting this monster at the bottom of the tower, the music begins with a more energized but similar version of Catastrophe, which was heard during the creation of the Floating Continent. While we let this music warm us up into this epic four-part fight and create an intense aura for fighting a final boss, we must not lose sight that this a quote of music used previously in the game. Like a written quote, a musical quote can remind us of some earlier utterance. This particular quote reminds us of Kefka’s master plan that snuck under the nose of everyone in this story as he gained the ultimate power available in this world—power he used to destroy the world for the sake of destruction itself just as soon as he was able. It is a means for the player to remember all those evil moments that the party has lived through in the story. Remember when Kefka poisoned the river to kill everyone in the castle? Remember when the party had to witness Cyan’s poison-murdered family walking on to the Ghost Train immediately afterwards? Remember how Kefka even betrayed the evil emperor Gestahl himself? Good! this music says. Now is the party’s chance finally to bring this utterly evil villain to ruin, there being literally nothing else to lose. The speech immediately prior to the fight and the music that starts it off truly bring that empowering feeling into play, creating a compelling final fight from the very first turn, and this is only the beginning.